Discover daily spiritual truth and application gleaned each day from current events and historic happenings. Each devotional relates something significant that happened on that day and then connects the reader with a devotional takeaway from that event. Readers will experience spiritual truths and connection with God through lessons from the past. - Publisher Where were you the day . . . ?. Did you know . . . ?. Remember when . . . ? We love to reminisce and rehash historical facts. History is filled with events that changed the course of a nation and others that altered the path of a life. A common thread remains consistent, though: God has been there through it all. Everything that happens is under his watchful care; he gives us countless opportunities to take notice of his activity, as well as the Bible to guide us. Author Dianne Neal Matthews blends 365 memorable events in history with Gods scriptural wisdom; the combination provides a constant reminder of Gods presence in the world. Brief daily readings and questions will keep you thinking about his active loving-kindness as you go about your routines. Keep fresh with a nugget of truth each day. Theres no telling how youll see God work next. 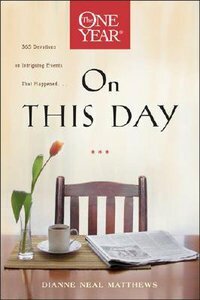 About "On This Day (One Year Series)"
Where were you the day . . . ?. Did you know . . . ?. Remember when . . . ? We love to reminisce and rehash historical facts. History is filled with events that changed the course of a nation and others that altered the path of a life. A common thread remains consistent, though: God has been there through it all. Everything that happens is under his watchful care; he gives us countless opportunities to take notice of his activity, as well as the Bible to guide us. Author Dianne Neal Matthews blends 365 memorable events in history with Gods scriptural wisdom; the combination provides a constant reminder of Gods presence in the world. Brief daily readings and questions will keep you thinking about his active loving-kindness as you go about your routines. Keep fresh with a nugget of truth each day. Theres no telling how youll see God work next. Dianne Neal Matthews is a writer, a speaker, and a member of the Advanced Writers and Speakers Association. The author of two other popular devotionals, and Drawing Closer to God: 365 Daily Meditations on Questions from Scripture. Matthews lives in Illinois.